Twenty-five of the most popular and accessible songs from "Singing the Living Tradition" and "Singing the Journey". Twenty-five of the most popular and accessible songs from Singing the Living Tradition and Singing the Journey, in simple arrangements and larger 9 x 12 format. For families, summer camps, RE and multigenerational worship. Click here to listen to three songs from Come Sing a Song with Me performed by children's choirs at First Parish of Concord, MA. "Sing a new song! What a joy to have these child-friendly arrangements of our beloved songs. Music takes us where words alone cannot, lifts our spirits and binds us together across the generations. We sing our beliefs, our values, our dreams, our praise and our gratitude. This collection gives us every reason to sing and rejoice!" "This wonderful songbook provides us with a deeply meaningful way to share music with our children. Singing together in community is one of the most profoundly important expressions of spirituality that we can offer one another, and the songs in this book touch the core of our UU Principles, bringing them to life. It is a great honor to be included in this very special publication." —Shelley Jackson Denham, composer, "When I Am Frightened"
"Now that I've strummed and hummed my way through this songbook, I can't imagine leading a multigenerational event without it! With arrangements as playable as the songs are singable, Come Sing a Song with Me fills a longstanding void in Unitarian Universalist worship resources. This collection of old standbys and new favorites is destined to be found wherever UUs--young and old, gather together to lift their voices in song." "This songbook provides religious education programs and youth groups with a wonderful variety of songs from a wide range of ethnic and spiritual traditions. There is something in this book for just about any worship experience or group setting. The succinct notes about each song's author, history or faith tradition are excellent and help people to learn more about how song helps us 'pray twice.'" "This is a wonderful resource filled with singable songs that warm the heart, inspire the spirit and bring courage to the soul. These are songs we love and will love even more as we use this songbook in a myriad of ways to weave community together with the threads of hope, possibility and love. These are the songs of our Unitarian Universalism come alive." 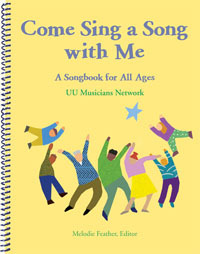 "With simplified arrangements of songs selected from both UUA hymnbooks, Come Sing a Song with Me provides a welcome and effective approach to making UU music more accessible. Children who are learning to read music, as well as novice adult musicians, can now make these songs their very own. What better way to encourage more inclusive--and frequent--group singing!" —Joyce Poley, composer, "One More Step"
"This collection of child-friendly hymns for use with intergenerational worship is just what religious educators have been seeking. The brief comments on the songs enrich old favorites and introduce new selections that are bound to become favorites. This songbook is perfect not only for helping children sing along in church but also for helping families to connect to their faith and extend the religious experience for their children into the home."